NBC's comedy has become a cultural touchstone for big picture pondering, so IndieWire went to creator Mike Schur to answer the biggest question of all. TV writer and producer Michael Schur doesn’t believe you can become a better person. But in the grand scheme of things, he’s not sure it matters. Schur said that no matter how benevolent your intentions, it’s unlikely you’ll incrementally improve yourself, every single day, without falter, until the inevitable moment of your death. People screw up. It happens. Anyone who’s seen his latest series “The Good Place,” knows that’s only part of the answer — don’t worry, the other half is coming — just as they recognize why he’s being asked the question in the first place. After creating a beloved comedy about American politics (“Parks and Recreation”), Schur expanded his view beyond this world to the age-old question of what comes next. Questions about life, death, and the meaning of our actions continue to surface, and Schur has found a unique connection with his audience by actually providing rational, human answers. They may be simple. They may be specific to one or two people within his windy story, but they speak to everyone’s innate search for understanding. Bridging the gap between philosophy and entertainment, “The Good Place” has become a cultural touchstone for anyone looking for answers to life’s biggest questions, and that’s not something every network sitcom can pull off. Schur’s comedy, about a group of recently deceased humans trying to become better people so they can get into heaven, is built around elements far more complicated than most sitcoms. In “The Good Place,” characters are given ethics lessons on Friedrich Nietzsche and Immanuel Kant. Decades-old thought experiments are acted out with visceral (and bloody) consequences. Episodes can act like experiments themselves, dedicating half-hour blocks to evaluating theories like utilitarianism and determinism. Schur knows these are big ideas, noting how entire societies have been struggling to answer “What does it mean to be a good person?” for thousands of years. But he chose his subject and genre with purpose. 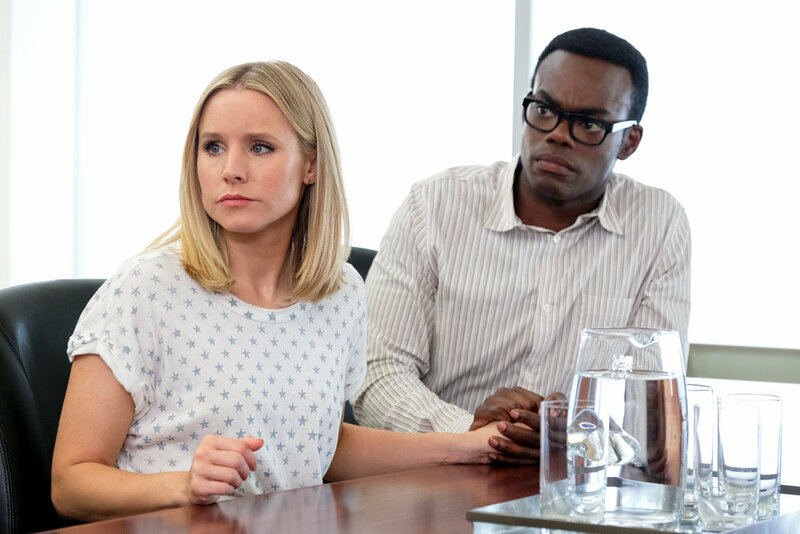 Eleanor Shellstrop (Kristen Bell) is both good and bad — depending on your tolerance for never picking up the tab — and watching her learn if she should go to The Good Place or The Bad Place needed to be told as a comedy. Publications like Vox and The Guardian are digging deeper into the philosophical discussions raised on “The Good Place.” YouTube videos are being made to explain things further, and even those hoity-toity institutions are using the sitcom to better educate the masses. Like plenty of significant pop culture before it, the show is becoming a tool for learning, even though its creator still claims only a “Wikipedia entry-level” understanding of ethics. But setting aside improved communication about hard-to-discuss topics, what role can TV hope to play when examining questions that scholars have struggled with for so long? Can “The Good Place” be more than entertainment? Schur argues it doesn’t need to be, even if it transcends that base service for some viewers. Still, all of that study for “The Good Place,” all of that time in a room with “really smart people who have really interesting views,” all of that effort put into answering what it means to be a good person adds up to this: Michael Schur has a theory for the meaning of life. To get all that from a TV show says a lot for the series itself, especially when Schur’s derived philosophy may not be the same one fans learn along the way. “The Good Place” is a show asking a lot of big questions, but taking the time to search for answers is what’s turned it from great television into a cultural touchstone. “The Good Place” Season 3 finale airs Thursday at 9:30 p.m. ET on NBC.